©1996 Orson Scott Card (P)2005 Blackstone Audio, Inc. I read this book originally when I was in Afghanistan in 2003. I remember that I got a brand new copy out of a sack of books that some good citizen sent over as a care package. What a treat. I remember at the time that I was rereading old John Grisham novels; audiobooks were something that I was barely into at the time, In Germany I had bought some Left Behind audiobooks at the PX, that's probably what really got me hooked, but I had long since listened to those and this book was fresh material. Anywho, I couldn't put this book down once I got into it back then, and likewise I couldn't stop listening to this audiobook once I got into it recently. I had forgotten some things about the book in the past five years. It's amazing to go back and listen to books that you've read and pick up on things you'd missed. The book is a really great concept and it kind of makes you think real hard about the influences that shape history, and how a handful of motivated people really push things in the world, and between my two readings it made me think of how my impressions have been influenced by recent history and how I have changed in the past five years. Only great books have that power. Also I would like to thank Orson Scott Card for his new Sci-Fi review page on audible.com. I had wondered out loud in a previous review what Mr. Card thought of audible.com. I suppose that he has given his endorsement and this is good. For me audible is the most valuable service on the internet aside from iTunes. I would never have discovered a book like Star Born without his suggestion, and right now I have Star Born and Star Dance in my shopping cart. Time to head off to the stars. Thanks again. I thoroughly enjoyed this book. I have read a few of the other reviews for this novel and was surprised to find a lot of negativity with respect to the historical and philosophical content. I enjoyed listening to the lives of people of whom I'd only briefly heard in history text books. It reminded me in that way of the Ken Follet book, Pillars. The characters from 500 years ago seemed more real, believable, and far less boring then I'd originally thought. The philosophical dialogues about time travel and reality, while a bit difficult, were just a small part of the novel. And I believe it's good to think about difficult and strange things sometimes. I have read and listened to many of OSC's books and have enjoyed all that I've come across. This book, while perhaps not as Sci-Fi as some might expect, was very entertaining. The characters were moving, and the narrators were great - You'll recognize the narrators from the Ender's Game series. Several times I found myself stalling whatever errand I had to get to so that I could find out what would happen next - a sure sign of a good thing. I thought this book was wonderful, and would definitely recommend it. I have read most of what Card has written and this is one of my favorites. I enjoyed the exploration of what humanity is and what sacrifice for humanity may require. The readers are excellent and I recognized them from the Ender's Game audio book so I was thrilled to see them doing this one also. Though this book is somewhat different than his other books, it still explores the human condition which is a favorite topic of Cards. I thought the characters were more developed than some of his other books. I cared about them a great deal and felt their pain as they struggled to make decisions that affected all of humanity. I enjoyed the thought experiment of what does it mean to change history at the cost of your own history. I bought this book because OSC had written it and I enjoy most of his work. The description was not compelling to me, but I pressed play. What a wonderful tale! The blending of history and SCIFI is as smooth and seamless as I've ever experience. The possibility of a present vastly different from our own is very compelling. It is a bold and panoramic landscape rendered to the detail of sand grains. Read it. I enjoyed the book, when I finally finished it. There was a great deal of earnest ethical debating, much of which I found to be tedious. It's like there was 85% prologue debate and 15% story and action. As I said I did end up appreciating the book and its redemption. Which is the greater evil perpetuated throughout time: human slavery or human sacrifice? This is question posed when the Pastwatch team learns they can change history. Indeed, they find that a Pastwatch team already has, and now it is perhaps their responsibility to undo the damage. One part science fiction, one part historical fiction, and three parts philosophy, Pastwatch is at its heart a novel about honor, cruelty, and humanity. It's about individual lives vs. the broad strokes of cultural identification, and the small changes that can have effect beyond measure. It is a novel that succeeds in the tradition of the greatest of sci-fi novels and historical treatises in that it engages the reader and asks larger questions, starting with the most powerful one of all: "What if?" I'll be the first to admit that, while I love history and actively seek it out, there is very little that I know about the personality of Christopher Columbus. To that end, I can't compare Card's interpretation of Columbus' character with that of the historical man. That said, the character portrait that is painted adds to the depth and nuances of a story that school children are taught in a very straightforward manner. It's a masterclass in the ripple effect of history, how one person can make a difference, and how it's not always possible to judge the past based on the morals and expectations of the present. At the same time, this book succeeds as a great discussion of the causation of time travel. The tale is so interwoven, I half-expected the Pastwatch team to see a TARDIS in their scrying. This book is truly as thought-provoking as Ender's Game at every level. Suffice to say, top marks all around. The characters are personable, the gravitas of the story is palpable, and multiple narrators of this audiobook lend that extra level of performance that brings us directly in the middle of all of this. Card is on record as saying that there are two more books proposed for this series, and as of yet he hasn't delivered. This one operates as a standalone, but the possibility for more is quite open. I'm not sure why people listen to audiobooks if not for the incredibly entertaining imagination that lurks behind the story. 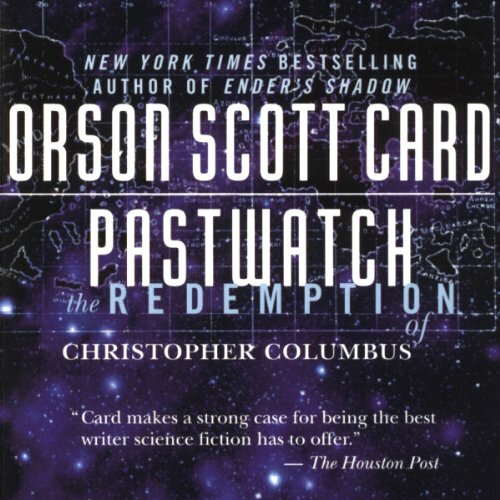 This is classics Orson Scott Card he went and once again redefined his genre this is Science Fiction at it's best. He went and made a book that looks at what our history could have been had things happened differently. His theory is sound, and I'll admit a little long winded at times but it quickly evolves into an incredibly intriguing narrative. This was my first Orson Scott Card book. After reading the other reviews, I thought this would be right up my alley since I love history, sci-fi, and time travel related stories. It took so long for anything significant to happen that I lost interest several times and had to rewind a bit after laying off up to a week in order to get back into it. In fact, I actually fell asleep on the book 3 or 4 times. Having said that, the plot is based on an excellent concept. "What if" stories can be exciting and thought provoking if done well. The last 2 hours are quite good. Unfortunately, it takes the author too long to get to get to the point. Person 1. We need to go back in time to fix this. Person 2. I agree, but it's impossible. Person 1. But we have no choice, we must. Person 2. If it were possible we might, but it's not. And would we have a right to if we could? Person 1. Maybe not, but we have to. So we must. Person 2. Ok, we have to. But we can't because it's not possible. So we won't. Person 1. But we must, and I think we can, so we will. We just have to figure out how. Person 2. I don't think we can, so I won't believe it if we do, but ok. Imagine that conversation lasting 15 minutes but accomplishing no more. That will give you an idea why this book lasts over 13 hours. It's very long winded. 2. Author seemed to overtly reach far and wide to find all unique names I've never heard before. It may be boring if everyone is named Steve, but are there to be no westerners in the future? 3. Gives very detailed historical accounts with extremely long dialogs between characters that would fit well into a history book but are not really important to a novel. You can feel the author thinking, 'I'm mixing real history with fiction.' Comes across as forced and artificial integration of two different genres. I know i've said he's let me down before but i'm a sucker for a good, moderately reasonable time travel tale. This one is very interesting and actually hits on a smart moral point. Intention versus results.I kinda dug it. Especially nice was the more conciliatory look at the Spanish conquests as religiously driven from the point of view of they did think it was a positive move despite the greed, violence and intolerance... interesting. My wife and her brother had been telling me to read this book for a couple of years, but it wasn't on audio and I have no time for dead trees. As both a time travel fanatic and a devotee of alternate histories, I thought this book was extremely well done. The level of craft that went into not just developing the details, but telling the story in a coherent and compelling way, is highly admirable. Also, it is really interesting to see how Christianity fits into the plot. I'm a Pagan, but I really like how it was used here and don't see how the story could have been done without it.